The launch of Orbital Sciences Corporation's Cygnus spacecraft atop an Antares rocket from NASA's Wallops Flight Facility pad-0A in eastern Virginia on Thursday, Jan. 9, 2014. 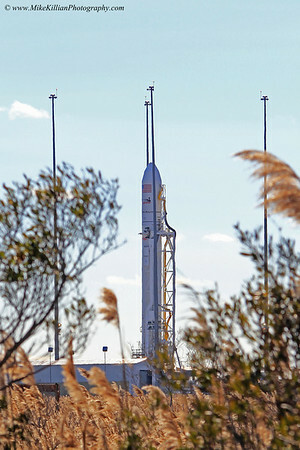 The mission, Orb-1, marked the company's first of eight operational resupply flights to the International Space Station under a $1.9 billion Commercial Resupply Services (CRS) contract for NASA. All images © copyright 2014 Mike Killian Photography, all rights reserved. Both north & south launch pad views, with launch commentary, capture the power of Antares rising, beginning an 18,000 mph chase to deliver Cygnus with fresh supplies to the crew on the International Space Station. Both views shot from 250-300 feet from the rocket.